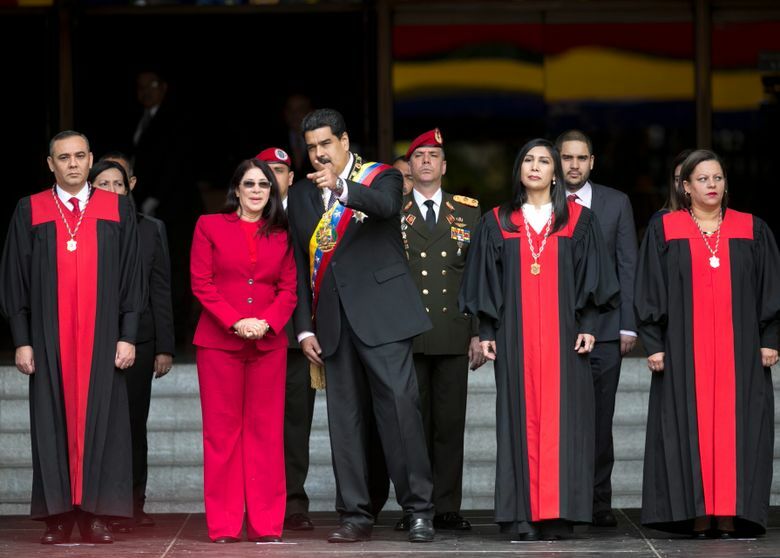 CARACAS, Venezuela (AP) — Venezuela’s Supreme Court ruled it can take over the powers of congress in what opponents of socialist President Nicolas Maduro as well as foreign governments denounced as the latest step toward installing a dictatorship in this South American nation. In a decision late Wednesday, the magistrates said that as long as lawmakers remain in contempt of past court rulings nullifying all legislation coming out of the opposition-controlled National Assembly, the high court can step in and assume congressional duties itself. Peru’s government immediately recalled its ambassador in protest while condemnations poured in from governments across Latin America. The head of the Organization of American States called for an emergency meeting to deal with what he called a “self-inflicted coup d’etat” by Maduro against the congress. Some hard-line Venezuelan opposition members went on social media to appeal for the military to intervene, and a few protests broke out in the capital. 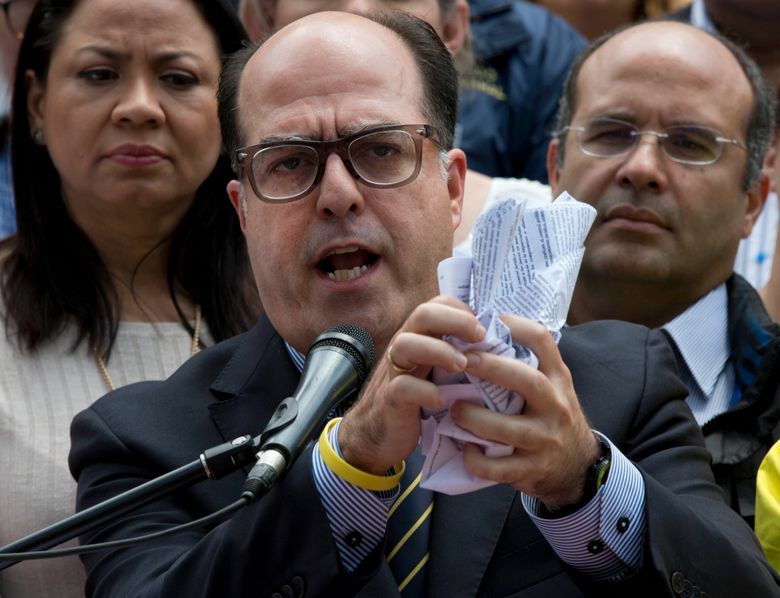 “This rupture of democratic and constitutional norms greatly damages Venezuela’s democratic institutions and denies the Venezuelan people the right to shape their country’s future through their elected representatives,” the U.S. statement said. 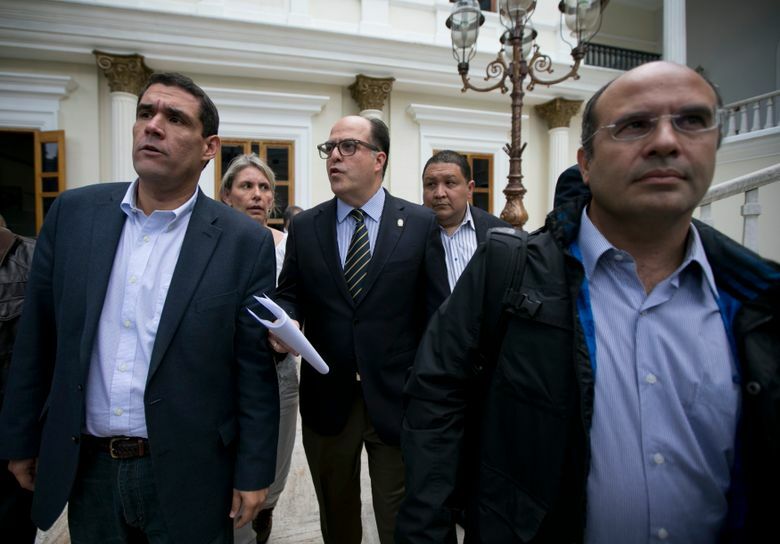 While past decisions by the government-stacked Supreme Court had stripped power from congress, Wednesday’s move allows Maduro to rule by fiat, said Julio Borges, the assembly’s president. He joined opposition leaders in calling for a new round of demonstrations beginning with a march Saturday, although recent attempts to apply street pressure on the government have failed to attract a large following. It was not immediately clear, however, what practical impact the ruling might have. Maduro has jailed dozens of opponents and ridden roughshod over lawmakers’ powers ever since the opposition swept congressional elections by a landslide in 2015 and immediately set out to remove the socialist leader from office through a recall referendum. The high court a year ago issued an order automatically nullifying all legislation coming out of congress, and earlier this week it moved to limit lawmakers’ immunity from prosecution. Foreign governments are increasingly taking notice of the shift toward authoritarian, one-party rule. Earlier this week, diplomats from the hemisphere gathered at the Organization of American States in Washington to debate whether to punish Maduro for breaking the democratic order and rule of law. There was no consensus on a proposal by OAS Secretary General Luis Almagro to suspend Venezuela, but the tension-filled session, in which Venezuela’s representative hurled insults at other diplomats, ended with a pledge by 20 nations to closely watch the situation and take steps to ensure the government engages in dialogue. A smaller group of 14 governments, including the U.S., have also called for immediate elections to resolve the stalemate. Maduro’s government last year cancelled a recall referendum seeking to remove him from office before his term ends in 2019 and suspended gubernatorial elections the opposition is heavily favored to win. 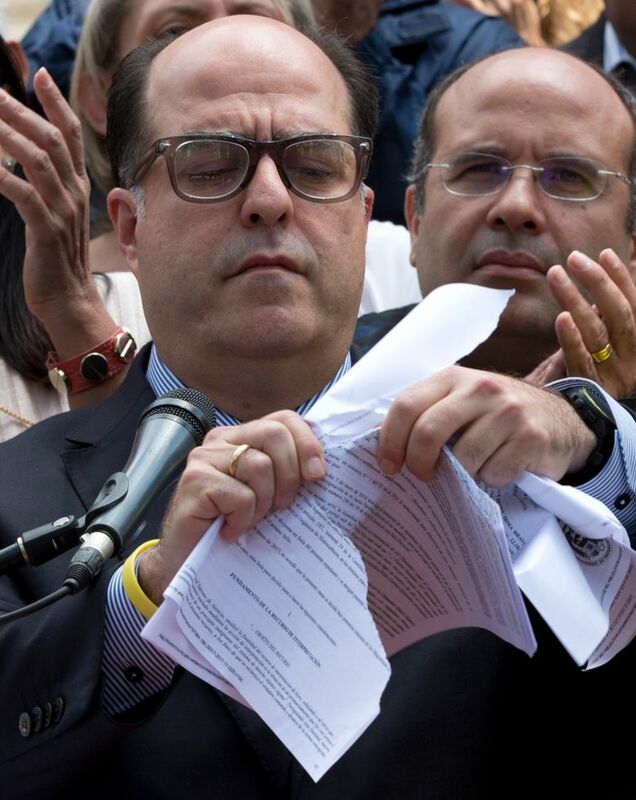 Almagro, in a statement, said the Supreme Court’s latest moves lacked even the most basic guarantees of due process and violated Venezuela’s own constitution as well the Inter-American Democratic Charter, which the late Hugo Chavez helped to promote. Throughout the day Venezuelans seemed in no mood for a fight. Except for a small group that protested outside the Supreme Court and another that briefly blocked traffic on Caracas’ highway, streets were calm as Venezuelans accustomed to Maduro’s aggressive tactics spent time waiting in long lines for food and going about daily chores that have become increasingly difficult as Venezuela’s economy has suffered. In the evening, however, people in the capital emerged onto balconies and gathered in front of homes banging pots and pans in a clamor of protest. Shouts of “Get out Maduro!” could be heard from a few buildings in Caracas. “The 30 million Venezuelans need to take to the streets and confront the dictatorship,” said Daniela Tani, a coordinator for one of Venezuela’s opposition groups who joined about 50 people blocking one of the capital’s major roadways. The protesters waved flags and stopped traffic until being surrounded by police trying to clear the street. The court’s surprise ruling stemmed from congress’ refusal to authorize a joint venture with private companies by Venezuela’s state-run oil company. State media said the court’s ruling was not seeking to supplant congress but rather to guarantee the rule of law so long as congress remains obstructionist by refusing to sign off on a budget and key economic decisions that Maduro says are needed to overcome widespread shortages and triple-digit inflation. 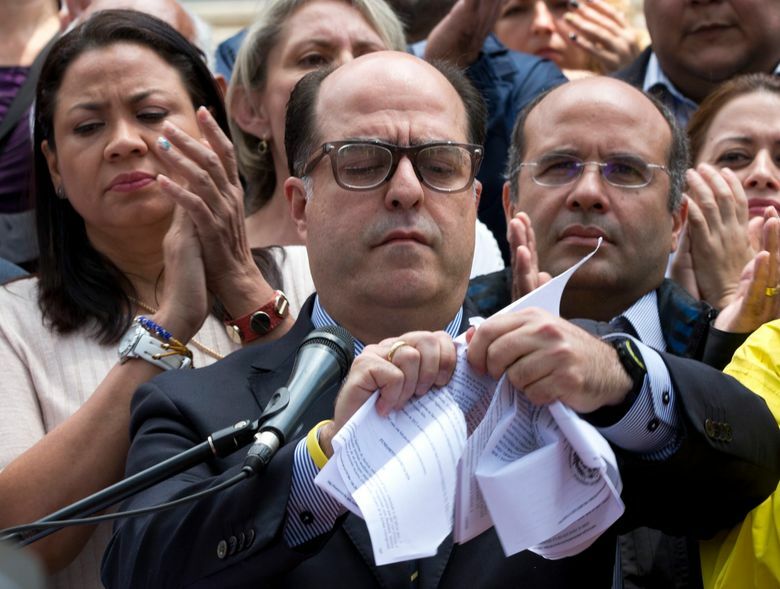 “We denounce the conspiracy by the region’s right-wing to attack Venezuela’s democratic system,” Foreign Minister Delcy Rodriguez said on Twitter. Associated Press writer Jorge Rueda reported this story in Caracas and AP writer Joshua Goodman reported from Bogota, Colombia. Associated Press photographer Fernando Llano in Caracas contributed to this report.